More than ever, d’a is the magazine that professionals appreciate and respect for its critical view of the world of building. Its sharpness and independence in the choice of works it presents and working materials it promotes have helped build its reputation and legitimacy as a trendsetter for architects, economists, engineers and builders. d’a has always been very proud of its editorial independence. We have earned this freedom thanks to the ever-growing trust of all of our readers, who are architects, building professionals, industry specialists or partners. • d’a Interiors (Special Issue entirely devoted to the latest trends in interior design). Both have confirmed their success and will continue to be offered in 2017. With its 120 pages, d’a interieurs is now the reference publication in the field, presenting all the latest designs and innovations : strong editorial content (very clear an very visual presentation of 25 projets illustrated by surveys, portraits, interviews and analyses of new trends). a very effective resource when drawing up prescriptions. d'a magazine has created an emailing formula reserved for advertisers, sent to 180 000 contacts (subscribers, reader departments,former subscribers and working architects) after each issue (8 over the the year and one special issue). Apart from the general message of the press release; the emailing is designed to inform the same contacts about a technical innovation or suggest a personalised message. The advertiser will be able to take advantage of this offer (d'a magazine and d'a emailing) to strengthen and extend its credibility in the eyes of the readership. Amongst architects AMC and d’a magazines are the most often mentioned. 1 - d’a has the furthest reach in the “architects” segment, 59% of this target group declare that they read the publication regularly. 2- Among its competitors, only one other magazine is OJD-listed. 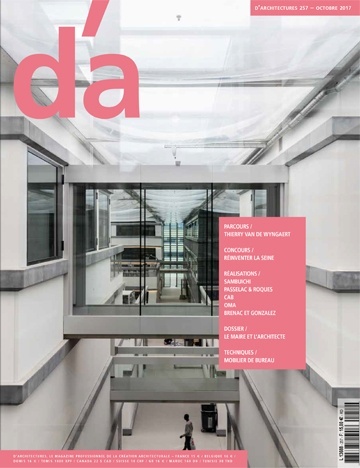 d’a has a very high subscription rate (50%) and is best placed in newsstands and specialised libraries (20%). *NB : Presentation text of 500 symbols max (spaces included) with contact (name, email, phone number, website), & a logo. Required elements: Ad(s) in the chosen format, 5mm bleed on the four sides, on digital support (CD, DVD…), as secure pdf file, otherwise real-size JPEG images in 300 dpi resolution, or Illustrator© files (≤CS2) or Xpress© files (≤6). For the two latter, please join all Mac imports and fonts that were used. In all cases, please join a Cromalin© proof or a reliable digital colour proof. Address book: Please send your logo (final format 45mm x 45mm), the address of your company and a description of your company of max. 100 signs. E-mailing: Please send an image in jpg or gif format, 245 px (width) x 104 px (height), the name of the product/ the company or a short title as well as a text of 100 signs including spaces (txt format, text only preferred), an e-mail address, a website address. ftp transmission: Please contact us for connection details.